The Thermo Scientific Surfer Surface Area Analyser represents the ultimate development in terms of the characterisation of solids and powders, measuring surface area and pore size. The Thermo Scientific Surfer is one of the most advanced surface area analysers on the market and applies the static volumetric method to determine, at cryogenic temperatures, the quantitative interaction of gases with the free surface of solids and powders. Surfer has been designed to meet the most demanding requirements in terms of precision, reproducibility and speed of analysis. Thanks to its greatly reduced dead volumes, high precision control of the cryogenic liquid level and special algorithm for pressure measurement linearisation, Surfer requires only half the sample amount that is typically needed by existing gas adsorption techniques, thus reducing the required analysis time. This is particularly useful with samples that under existing methods take more than a day to test! 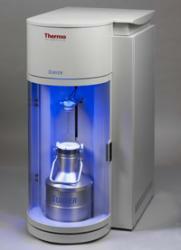 Customisation and modularity are important benefits of any surface area analyser and the Thermo Scientific Surfer enables the analyst to obtain the best results in terms of measuring surface area and pore size for any kind of material, from extremely low surface areas (non-porous) to very high surface areas and large pore volumes (e.g. the case of micro and mesopore samples). Surfer can be configured and customised easily on demand also according to the available budget, choosing from a wide range of vacuum pumps, pressure gauges, valve types, etc. The system can be easily upgraded at any time. To find out more about the Surfer analysers please fill out the form below.